The Lush Spring Prize is committed to protecting and respecting your privacy. Any questions regarding this Policy and our privacy practices should be sent by email to lushspringprize@gmail.com, or by writing to Ethical Consumer Research Association, Unit 21, 41 Old Birley Street, Manchester, M15 5RF, United Kingdom. Alternatively, you can telephone 0161 226 2929. The Lush Spring Prize celebrates projects around the world that are increasing the capacity of communities and societies to thrive in harmony with nature and each other. The Lush Spring Prize is run by Ethical Consumer Research Association on behalf of Lush Cosmetics. We obtain information from you when you submit an entry application. As part of the nominations process, we require a limited amount of personal information, including your name, and personal contact details. The website also collects IP address and assigns your nomination a unique ID number. Some information is shared with third parties as part of administering the prize. This involves circulating nomination forms to our shortlisting team and to our international panel of judges. Non-English language applications are also translated by a translation company. Only necessary information is shared with each third party. That means personal contact details are removed from the nomination form before circulation. We pass some of your information to third party service providers, agents subcontractors and other associated organisations for the purposes of completing tasks and providing services to you on our behalf (for example to process nominations and send you mailings). Please be reassured that we will not release your information to third parties beyond the Lush Spring Prize network for them to use for their own direct marketing purposes, unless you have requested us to do so, or we are required to do so by law, for example, by a court order or for the purposes of prevention of fraud or other crime. Google Drive for storing nomination forms. We never rent, sell or share your personally identifying information with other companies or individuals. Nor will your information be used for automated decision making or profiling. You have a choice about whether or not you wish to receive information from us. If you do not want to receive updates from us about the Lush Spring Prize, you can unsubscribe from these communications using the link provided at the bottom of each message. The accuracy of your information is important to us. If you change email address, or any of the other information we hold is inaccurate or out of date, please email us at: lushspringprize@gmail.com or by writing to Ethical Consumer Research Association, Unit 21, 41 Old Birley Street, Manchester, M15 5RF, United Kingdom. Alternatively, you can telephone 0161 226 2929. If you wish to exercise any of these rights please contact us via email: lushspringprize@gmail.com or by writing to Ethical Consumer Research Association, Unit 21, 41 Old Birley Street, Manchester, M15 5RF, United Kingdom. Alternatively, you can telephone 0161 226 2929. Please be aware that the exercise of some of these rights in relation to an active nomination will mean that you cannot be considered for the Lush Spring Prize in that year. Nomination forms are stored on our web server and on our Google Drive until nominations open for the next years’ Prize and off-site secure back-ups of the site database are maintained in case we need to recover data. Ethical Consumer Research Association is the controller and processor of Lush Spring Prize data for the purposes of the DPA 18 and GDPR. 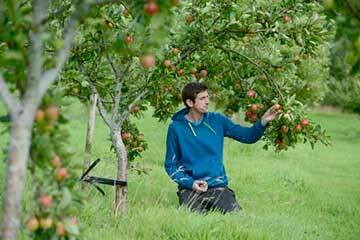 Rob Davidson from Cyrenians walking under an apple tree.